No Pockets? No problem!The ultimate hands-free solution to stashing your stuff!StashBandz with multiple different uses, is the only cute fanny pack, insulin pump belt, waist pack, money belt, and travel belt, uniquely designed to hold large cell phones, a passport, and all your extra on-the-go travel accessories. Go hassle free with freedom from a purse. Safely travel the world holding as much as your purse discreetly undercover. Rock-out at concerts worry-free (hides a flask). Go purse-free at theme parks, sporting events, at the office, and everyday errands. Throw in an ice or heat pack for menstrual cramps and backaches. 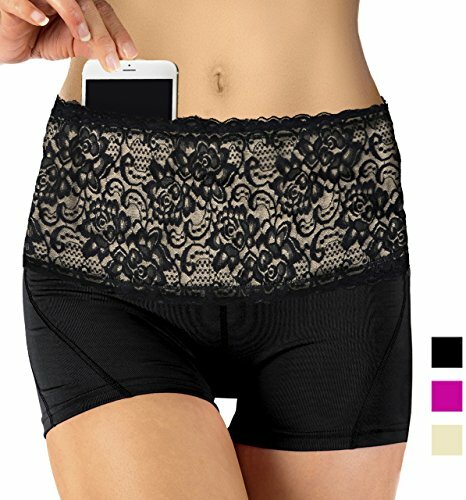 The all-in-one accessory, providing secret pockets for any hands-free, purse-free occasion.Sizing: The success of your hip belt depends on a good fit. If your belt does not stay in place, you have the wrong size. Sagging = too big, riding up = too small. We offer free exchanges. Please follow our sizing chart. We take all factors into account, such as, pockets being fully loaded with high activity, and worn over clothes.Shipping: Orders ship from California via USPS first class mail or USPS Priority, if expedited if chosen at purchase. Orders ship within 24 hours Monday-Thursday. Orders received Friday-Sunday are shipped on the following Monday, pending holidays Returns or exchanges: Your satisfaction is guaranteed! Returns or exchanges are never a problem. We offer free shipping to exchange an item. You ship the item back to us, and then we pay for shipping the new item. Further questions? Ring us toll-free; we're here to help! FOUR WIDE POCKETS. All-in one travel money belt, fashion fanny pack, insulin pump belt, and waist pack, uniquely designed to hold cell phones, and on-the-go essentials without the burden of a purse. HOLDS ALL AT ONE TIME: Cell phone, passport, flask, ID, money, key fob, lipstick, eyeglasses, credit cards, inhaler, insulin pump, pepper spray, and travel accessories. Perfect for cell phones like the iPhone 6 or Samsung Galaxy S5, HTC One, Note 2-4. Holds large items in all pockets front and back completely concealed. Phone showing for photo purposes only. SILICONE STAY PUT GRIPPER STRIPS on the flip side of the hip belt keeps it in place for a secure no-slipping fit. Made of stretchy French lace with a Spandex mesh lining to keep items completely concealed. Not see-through. Wide 6 inch belt with four 7 inch pockets around the band circumference. Easy access pockets open at the top. BUILT-IN TUMMY TUCK. Fashionably hides a muffin top. Hides comfortably undercover, flat and lightweight. Or show it off, fashionably functional. No bulky zippers, buckles or Velcro that can cause irritation. Circular band pulls on like pants. See photo size chart to your left for the best fit. Free Exchanges. WARNING: BEWARE OF COPYCAT PIRATE LISTINGS. After you choose your size, make sure it says, "Ships from and Sold by Stashbandz". We are the only authorized seller of this Copyright, Trademarked product. We design and manufacture all our own products in the USA. We guarantee all our products 100%. Orders ship within 24 hours. Easy returns & free exchanges. If you have any questions about this product by Stashbandz, contact us by completing and submitting the form below. If you are looking for a specif part number, please include it with your message.